I love it when a fellow blogger shares a recipe that sends me down memory lane. 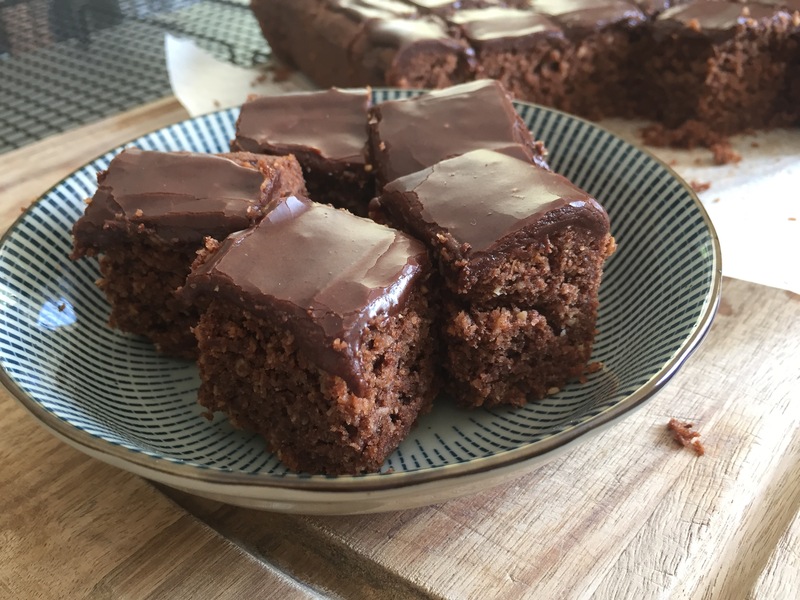 Glenda at Passion Fruit Garden shared this recipe for Chocolate Slice and it instantly had me thinking of my nan and book marking the post to see if I could recreate some of the magic. The original version is so simple it really is a great kids recipe but I tweaked my slice a little to make it a little more nutritious. The end result is definitely still a chocolate slice treat. I messed up making this in the final stages by making it too thick. Thinner is better for this slice in my opinion. 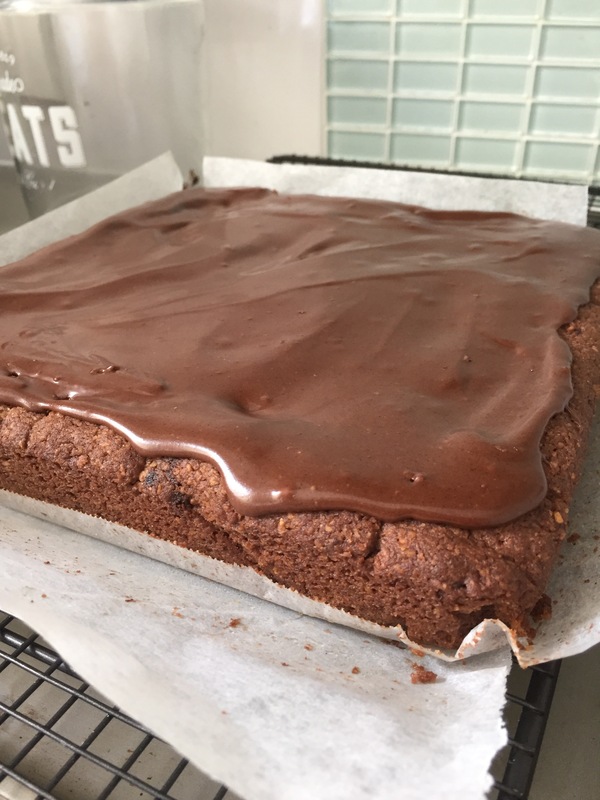 Not to say the thick squares I ended up with were bad, just more brownie like rather than reminiscent of my Nan’s baking. Line a lamington/deep baking tray with non-stick baking paper. 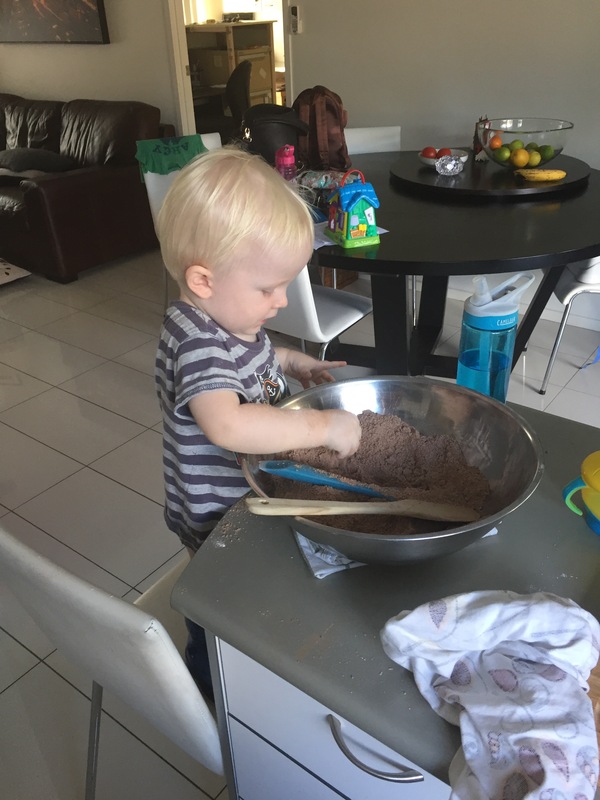 Sift the plain flour, cocoa and baking powder. Pour in melted butter and mix until combined. Spoon into prepared baking dish and press down firmly with the back of a spoon. Bake for approximately 25 minutes. Cool in the pan before icing. To make the icing, soft the cocoa and icing sugar. Add the milk and butter and beat until fluffy. Spoon over cooled slice and smooth with knife. Once the icing is set cut with a sharp knife into small squares. Will keep in an airtight container for a few days. Hi Leah. I have just made Francesca’s version. I am on a roll 😃 The recipe is on Taste.com under kid friendly. It is so good for kids to learn how to cook and these simple recipes are a great start. Btw yours looks good. Hi Leah. It has to be an old WW recipe but I haven’t found the original yet. The trouble is I don’t have access to my books. Very nice, Leah – and nutritious too. Isn’t that your first thought these days when you are cooking or baking. Mmm I remember Nan’s version well, I think I have both the recipe with weet-bix and the one without, haven’t made either for years. Sounds pretty easy to make. Looks good. I love chocolate cake. I’m a sweet eater too.